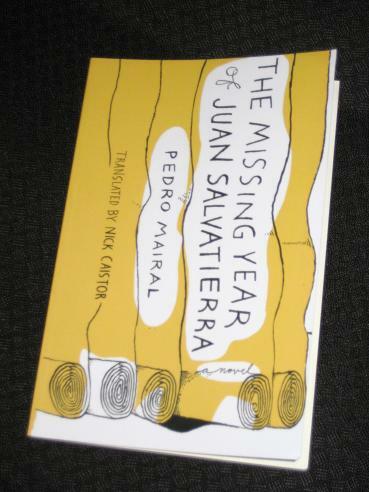 Pedro Mairal’s The Missing Year of Juan Salvatierra (translated by Nick Caistor, review copy courtesy of the publisher) is a book worthy of being New Vessel’s first release. The narrator of the story is not the titular Juan Salvatierra but his younger son, a man who lives in Buenos Aires working as an estate agent. One of the reasons for his move was to escape from his father – or, to be more precise, from the gigantic canvas painting Salvatierra senior spent his life creating. The Missing Year of Juan Salvatierra doesn’t run to much more than a hundred pages, but it’s a beautiful, well-written story. The narrator initially just hopes to settle some outstanding family affairs, but in searching for the missing roll, he finds much more than he bargained for. As well as discovering some interesting, unsettling and surprising facts about his father (and remembering the way the painting defined their relationship), he also starts to find out a little more about himself. In fact, his search for the missing piece of the painting leads to a complete reevaluation of his life. He decides to shut his office and return to his home town, cycling along old paths and walking by the river, the border between Uruguay and Argentina (which has its own role to play in the story…). In effect, he is revisiting the past, adrift in a town full of strangers, where the train station is abandoned and overgrown, and his father’s friends are long gone (or senile). One book it reminded me of a little, both in its measured pace and its subject matter, is one of Peirene Press’ class of 2013, Richard Weihe’s Sea of Ink. Both use the literary form to describe an artist and his art and both use short, concise chapters to great effect. And, like Juan Salvatierra, Bada Shanren was a man of few words (in his case, by choice though!). Thanks Tony, your review led me to New Vessel Press and I jumped on board with this offering. I'll be following up with more in coming months. Tony – No worries 🙂 I'm hoping to get to another one soon too .